GEORGE C. SR., on March 2, 2008, a 46 year resident of Broomall, now of Media. A graduate of West Phila. 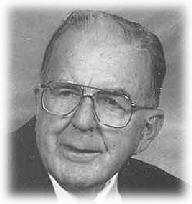 High School and World War II Army Veteran who served in Northern France, the Ardens, Rhinelands and Central Europe. He was awarded a Bronze Star for heroic achievement during the Battle of the Bulge and served as a past National President of the Veterans of the Battle of the Bulge and past National Commander of the Yankee Division Veterans Assn. George worked in the sales and marketing department for the Phila. Electric Company for 40 years. Survived by his beloved wife of 59 years Elizabeth R. "Betty" (nee Ryan); his children, George C. Jr. (Susan) of Portland OR, Jim (Sandy) of San Diego CA and Gail L. Hale (Bill) of Rose Valley PA; his grandchildren, Ryan, Austin and Brian. Interment Arlington Cemetery, Drexel Hill, Contributions in his memory to the Church of the Redeemer, 145 W. Springfield Road, Springfield PA 19064, or a charity of one's choice would be appreciated.